Because memory is such a selective, imperfect and malleable historian, we all invent and reinvent our autobiographies every day of our lives. Sigmund Freud told us that the answers to our confusions were locked in the secret drawers of our past. Photography, then, provides us with the documents. The family album, an autobiography in pictures, arrived in the nineteenth century. By the end of that century, small cheap cameras transformed it from a collection of serious studio portraits into a bundle of smiles, birthday parties, weddings, vacations, and puppies. 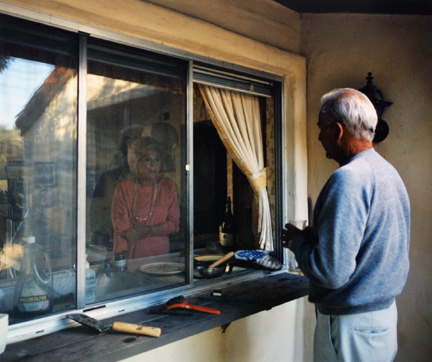 Larry Sultan’s own family album, Pictures from Home, is an autobiography in pictures that, through the inclusion of reels of home movies and the tales they prompt, helps to define the term “family.” What is pictured on the album page or living room wall—and what is not pictured—attests to a common desire for a tale of domestic happiness. The narrative here is one of relationships: that between father and mother, and between parents and son. It is always fascinating to follow a series of photos that covers the chronology of the same individuals; there is something terribly intriguing about watching the changes wrought by time and experience. What has been accomplished? Have expectations changed? How many people have you actually been? This sort of photographic timeline evokes the idea of degrees of happiness plotted on a graph. When we see Sultan’s mother Jean as a young woman, then a young wife and mother, we wonder if she ever had an inkling she would be posing up against the green wall, gaze as penetrating as ever. When his father sits on the bed in his suit, does he know how close or far he is to playing golf on the same type of carpet? The child photographing his parents reverses the social norm, complicating the sense of power, identity, and self-creation experienced on either side of the camera. Pictures from Home was initiated when Sultan’s father Irving was forced into early retirement from his career as vice president of the Schick Safety Razor Company.1 After combing through the family photographs, Sultan teased out his parents in their party best, plus enough publicity portraits of his father with the corner of his mouth turned up just enough to show he is p1leasant. Sultan then arranged the photographs into mnemonic clusters to assist in the act of remembering, the photographs, in their mnemonic clusters, simulating the likeness of storytelling and listening. Sultan interprets his father’s fate—the corporate discard of no-longer-young employees—and how the resulting frustrations and feelings of powerlessness find their way into family relations. Sultan undermines not only the authority of family snapshots but also his own work. He allows his parents to speak their own piece, their work (and his own in the book) questioning the nature of photographic vision. To most observers, these pictures will seem half respectful, half disdainful, sometimes compassionate, and certainly troubled—a son’s view of a life he did not relish and a dream he did not dream. However, Sultan once woke up in his parents’ house anguished about his project and stunned to realize that he wished to take photography literally—to stop time. “I want my parents to live forever,”2 he said, as if in agreement with André Bazin’s statement that “photography does not create eternity, as art does, it embalms time.”3 Ironic snapshots such asPracticing Golf Swing (1986) work to preserve an image of Irving Sultan locked in his daily routine, practicing his golf stroke while watching daytime soap operas in his boxer shorts, the diffused sunlight spilling through the sheer curtains, illuminating Irving’s bronzed and tanned physique from his lazy days sunbathing. 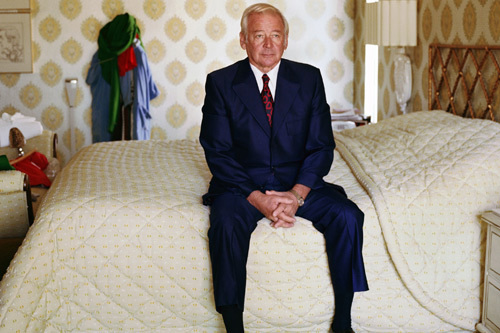 Often the voices of Irving, Jean, and Larry Sultan work against the photographs, sometimes confirming the apparent reality of the pictures and sometimes contradicting their purported documentary truth. Or is it the reverse? Perhaps photographs corroborate or complicate one person’s recollection. Jean’s successful career began, in reality, as Irving went into retirement. My Mother Posing for Me (1984) (Jean striking a leggy pinup girl pose) exudes an air of poise, Jean standing against the moss green wall stoically gazing off yonder, hands tucked behind her back. 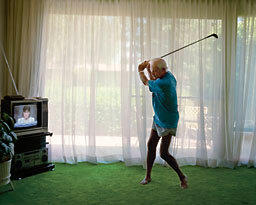 A comical tension arises from Irving’s presence in the snapshot: perched on the edge of his chair, watching sports, his body passively turned away from the camera so that we see only the back of his head. This does not conform to the conventions for what a family photo looks like. The ostensible import of this photograph as others in the collection is that family values are a dubious bargain and that success cannot cover the mortgage on happiness; the second generation could tell you a thing or two about that. Neither Sultan’s mother or father ever smile. The reason the parents do not smile is that their son instructed them not to. “What you call introspection looks to me like lost, empty, half dead,”4 he says. “Maybe I’m a little bored, but I’m not melancholy, longing for the old days of Schick or waiting for death. I think that’s your fantasy.”5 “ Honestly,” Irving Sultan says. “I’m happy to help you with your project, but for the most part that’s not me that I recognize in those pictures.”6 Sultan becomes a fantasist by weaving individual episodes together, as Edward Casey explains, “to realize a more or less coherent story line,”7 to witness the family album, which may not document a life so much as make one up, to influence the historical record. In every corporate picture of the Sultans, Jean hauls out the smile and bends one leg in the manner recommended to models at the time. Sultan prefers to paint a picture not of the joys of growing old but rather of the isolation that comes with aging. Sultan achieves this due to the photographic image’s special status as “a message without a code.”8 We neglect to realize that “man’s intervention in the photograph (framing, distance, lighting, focus, speed) all effectively belongs to the plane of connotation.”9Sultan’s use of the snapshot, the favored photographic format of North American families, seemingly so open and so casual, operates by its own clearly delineated rules. It gives the illusion of being a simple transcription of the real, a trace intimately related to the events it records (and the family myths it ultimately perpetuates). Instances such as My Mother Posing for Me (1984) self-consciously utilize this fact. Indeed, the compiling, the layout, the text, and the staging of the photographs act as physical remnants of Sultans’ daydream—of how things ought to be. The snapshot offers an intimate window onto the world. Susan Sontag explains that through snapshots, “each family constructs a portrait chronicle of itself—a portable kit of images that bears witness to its connectedness.”10 It is a candid way of remembering the benchmarks of suburban life: little league, the ranch house, the new car, family vacations. Snapshots are the medium by which we inscribe our history—or at least the history we want to preserve—of our dreams. The scratchiness, the imperfection, the intimate size make the snapshot so dear to the family and allow each family member to feel the presence of those loved ones even in their absence. However, in real life, a person is able to condense or embellish memory, salvaging fragments together into a new meaningful order. Although the camera relieves us of the burden of memory, the result is nevertheless ephemeral—a fleeting moment, like the memory itself—forgotten with the passage of time. Sultan ransacks the family album and home movies for clues to the gap between the lives his parents expected, devised and posed for, the performances they and their children appeared in, and the lives that time, circumstance and the usual insufficiencies forced them to live. The phenomenological possibilities of the photograph for Sultan attest to the complexities of the presence and absence of a person because photography is more than an illusion of being; it is a transcription of the real, an indexical trace—the material emanation of a past reality. Sultan’s pictures exist because something was there. The pages of Sultan’s album express a longing to understand the presentation of his parents as trim, well kept, and obviously financially comfortable, instead of aging and dissatisfied. They are stuck with each other and not entirely happy with the company. Imagery and narrative are almost disturbingly familiar. Sultan re-photographs and enlarges the standard shots or single movie frames of barbecues and prom nights, making them more bleached and blurred than one’s own family photos after their inevitable encounters with spilled coffee. Family photographs like these are weighted down with emotions as faded, fraying and elusive as the pictures’ subjects. This causes Sultan to appear as an amateur photo album compiler.11 It is a self-conscious attempt to disrupt familiar narratives about family life and its representations. This is notable in Conversation through Kitchen Window (1992) where his parents engage in a heated debate about what time to eat dinner. Here, instead of inserting conventional family photographs of happiness, success, and loving relationships in an attempt to paper over the cracks of family life, Sultan inserts the everyday. It almost does not matter whose family album it is. The house, the car, the parents who really were young once, the children with missing teeth and delicate bones, all are fraught with nostalgia. Martha Langford explains that, “the photographic album, the faithfully visited gravestone, is a monument to memory, its life-sustaining function in the present.”12 The family snapshot sits on the edge of memory like words on the tip of the tongue. And yet, there is always something deeply personal and private within the pages of Pictures from Home—something that makes photographs only relevant to the people associated with the people depicted in the photographs. Roland Barthes speaks of the private nature of the photograph, perceiving the Winter Garden Photograph of his mother as perpetuating love. He is comforted by its actuality—the fact that it literally emanated from his mother. There is an assertion of gentleness as he writes, “there was always a place set apart, reserved and preserved: the brightness of her eyes.”13 Sultan’s Dad Sitting on Bed (1986), in which Irving empathetically gazes at his estranged son, his eyes illuminated and his body immersed in darkness, recalls Barthes’ prized photograph. 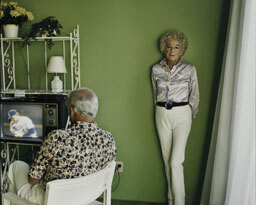 It is only Larry Sultan who will see love emanating from the photograph. This suggests not that photography lies, but rather that it is not absolute. Whatever truth it harbors is in the eye of the beholder—or perhaps in the photographer’s program, or in the editor’s wishes. Pictures from Home, as a revision of one family’s record, deftly navigates the elusive breach between fact and fiction in both its images and its narrative. Larry Sultan becomes a fantasist, abandoning the plasticity of conventional family albums in the hope of purporting the truth of his family. Although absent from the photographs, Sultan is more than evident in the text and in the taking of the photographs. According to Casey, “the fantasist … represents himself as partaking in the unfolding action of the fantasy.”14 Without the endearing words of Sultan anchoring the snapshots, the viewer might not recognize the series to be a testimony of love. Barthes explains that, “the text loads the image, burdening it with a culture, a moral, an imagination.”15 The reader so rarely thinks about the author, whose physical presence is absent from the work. Pictures from Home is both deeply personal, as well as controversial. We can imagine that each page, each text, and each image floods Sultan with a variety of emotions. However, the series is arguably not an emotional experience for the viewer. Rather, Pictures from Home undermines photography’s role as an instrument of family ideology, attempting to decode family photography, to remove it from its clichés, to de-mythologize domesticity. However, I would argue that this is impossible because the myth of ‘family’ is too embedded into Western ideals for the myth, as well as the expectations of the functions of family photography, to be severed. The camera cannot be separated from the myth of family—the camera is part of the myth.